An Ardrishaig driver who crossed lanes caused a police driver to brake heavily and swerve to avoid a collision. 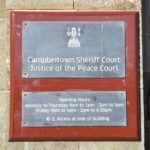 At Campbeltown Jusice of the Peace Court on Monday, out-of-work fisherman James MacKinnon, 27, of 3 Glenfyne Terrace, pleaded guilty to driving without due care and attention or reasonable consideration for others. The charge related to an incident, on April 18 last year, at the A83 at Erines’ bends near Tarbert. Two police officers driving a marked vehicle were confronted by MacKinnon approaching, at what appeared to be excessive speed and struggling to stay in his lane. As MacKinnon crossed the carriageway the police driver was forced to brake heavily to avoid a collision. The officers turned round and followed MacKinnon. When they stopped him, MacKinnon said he had just finished work and was in a rush to get home. Mackinnon was offered a fixed penalty ticket of a £100 fine and three points on his licence but chose to go to court and his guilty plea came at his trial diet. MacKinnon’s defence solicitor Derek Buchanan said it was a momentary lapse of concentration.